It takes a completely wild imagination and a disciplined eye to be creative. And no one proves it better than Atul Kumar, the artists of ‘Piya Behrupiya’, and every single person behind the curtains of this play. 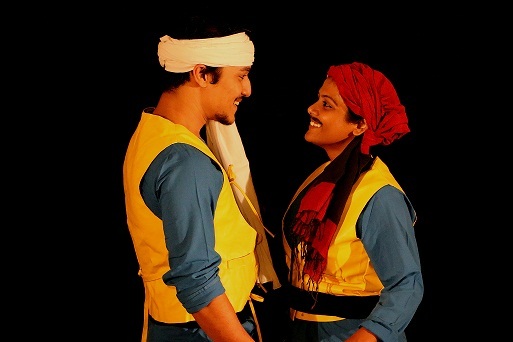 The audience at the Stein Auditorium, India Habitat Centre, was driven into fits of laughter as the vibrant artists of the play enacted Shakespeare’s “Twelfth Night”, a romantic comedy in a ‘Desi’ (Indianised) manner using traditional folk songs and music. In her grief, she fails to see Orsino’s love for her. To win her heart, Orsino engages the cross-dressed Viola to plead with Olivia on his behalf. Viola reaches Olivia’s home dressed as a Caesario and then follows a bitter sweet chain of events. The epic moment comes when Caesario introduces himself as “I belong to a very good family, bas thoda personal level pe disturb chal raha hoon (I am just a little disturbed at the personal level)”. Also, we have the Bengali Sir Toby (Olivia’s uncle) carousing with his friend Andrew Dada (Olivia’s Admirer) and dancing with Shakespeare’s clown Phool Singh (a fool in the Olivia’s household) on the song, “ Gori Tere Naina Re (O girl, your eyes)”. This time again at the India Habitat Centre, the artists weaved the same magic and received a standing ovation from the audience for the outstanding performance. And I believe, the one person who deserves a special mention is Amitosh Nagpal, who cleverly translated the play and is retelling Shakespeare to the people in a less complicated and folk form. Note: The play was performed at the India Habitat Centre on 27-AUg-2016. * This article is not for commercial purpose and just expresses the personal views of the author.